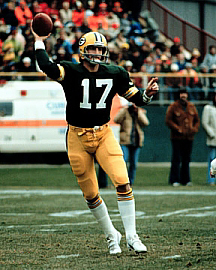 The Green Bay Packers were off to a 5-1 start as they played the Seattle Seahawks in Milwaukee on October 15, 1978. For a team that had endured five straight losing seasons, the last three under Head Coach Bart Starr, it was a tremendous turnaround. Second-year QB David Whitehurst was playing very well in place of the injured Lynn Dickey, RB Terdell Middleton (pictured at right) was spearheading the ground game, and rookie WR James Lofton showed flashes of the ability that made him a first-round draft choice. The defensive line had fine pass rushers in ends Ezra Johnson and Mike Butler, and CB Willie Buchanon was an established star in the backfield. Seattle, coached by Jack Patera, was 3-3 and coming off of an upset of the Vikings. QB Jim Zorn, a mobile lefthander, provided plenty of excitement and WR Steve Largent was highly reliable. FB Sherman Smith and HB David Sims were capable runners. The Seahawks, in their third year of existence, were an opponent to take seriously. There were 52,712 fans in attendance at County Stadium, where there was a chilly light rain falling. Things started off quickly for the Packers when WR Steve Odom returned the opening kickoff 95 yards for a touchdown. Chester Marcol added the extra point for the early 7-0 lead. Two plays following the ensuing kickoff, Jim Zorn fumbled and Green Bay recovered at the Seattle 35. It took just two plays for the Packers to capitalize as Terdell Middleton ran for 11 yards and David Whitehurst (pictured below) threw to James Lofton for a 24-yard TD. Marcol again kicked the point after and, with the game less than three minutes old, the home team held a 14-0 advantage. 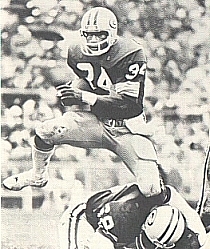 The contest settled into an exchange of punts until HB Rufus Crawford of the Seahawks muffed a David Beverly kick and DB Estus Hood recovered for the Packers at the Seattle 20. Four plays later Middleton ran for a five-yard touchdown, Marcol converted, and the Green Bay lead was up to 21-0. There was 2:36 remaining in the opening period as the Seahawks took over on offense, but Sherman Smith fumbled on first down and Ezra Johnson fell on it for the Packers at the Seattle 30. Whitehurst threw to TE Rich McGeorge for seven yards, FB Barty Smith ran up the middle for nine more, and Middleton carried for a 14-yard TD. Marcol added the PAT and Green Bay held a 28-0 advantage after a quarter of action. The Seahawks fought back gamely in the second quarter. A seven-play, 72-yard series that featured a Zorn pass to TE Ron Howard for 42 yards concluded with the quarterback scrambling around right end for a 12-yard touchdown. Efren Herrera kicked the extra point. A successful onside kick allowed Seattle to retain possession, but the resulting series ended with Zorn fumbling the ball away. However, Whitehurst, throwing long from the Seattle 37, was picked off by SS Autry Beamon and on the next play Zorn connected with Steve Largent for a 48-yard TD. Herrera’s extra point made it 28-14 and less than four minutes had been used up in the period. The Packers put together an eight-play, 58-yard drive in response that featured a Whitehurst screen pass to FB Jim Culbreath that picked up 17 yards. An apparent touchdown pass to Lofton in the end zone was nullified by offensive pass interference, but the Packers picked up another three points when Marcol booted a 22-yard field goal. The next few short possessions resulted in punts, fumbles, or interceptions, but no points, and the score remained unchanged at 31-14 after Herrera’s 45-yard field goal attempt at the end of the half sailed wide to the left. The Seahawks quickly ran into more trouble on the first play from scrimmage of the third quarter when Zorn fumbled and LB Mike Hunt recovered for the Packers at the Seattle 37. Five plays later, and after a Whitehurst pass to Lofton picked up 19 yards, Middleton ran for a two-yard TD, Marcol converted, and Green Bay was up by 38-14. Seattle responded with a 75-yard drive in six plays that included a Zorn pass to Largent for 24 yards and concluded with Sherman Smith running for a nine-yard touchdown. But the Packers came right back with another scoring series of 65 yards in eight plays. Whitehurst completed passes to Lofton for 16 yards and Barty Smith for 19 and Middleton ran for a nine-yard TD, his fourth of the day. The Seahawks managed one more score early in the fourth quarter when David Sims ran for a two-yard touchdown, but Green Bay’s third quarter scores had extinguished any hopes for a Seattle comeback. The Packers won by a final tally of 45-28. The point total was the highest for the Packers in nine years. Seattle, playing catch-up throughout the game, led in total yards (483 to 369) and first downs (23 to 20). Both teams did well running the ball, with the Seahawks edging Green Bay by 194 yards to 190. However, Seattle also turned the ball over seven times, to devastating effect, and with three of them coming in the first quarter. The Packers had three turnovers. They also accounted for the game’s three sacks, two of them (unofficially) by Ezra Johnson. The Seahawks were penalized 9 times, at a cost of 65 yards, to six penalties for 50 yards on Green Bay. Terdell Middleton had a big day as he rushed for 121 yards on 23 carries and scored four touchdowns. David Whitehurst completed 12 of 19 passes for 179 yards and a TD while giving up one interception. James Lofton had 5 catches for 98 yards and a score. In addition to his touchdown on the kickoff return, Steve Odom returned a punt 48 yards. For the Seahawks, Jim Zorn was successful on 17 of 31 throws for 308 yards and a touchdown, but gave up two interceptions. He also ran for 28 yards and a TD on five carries. Steve Largent (pictured at right) caught 6 passes for 127 yards and a TD. David Sims rushed for 104 yards on 22 attempts that included a score and Sherman Smith contributed 12 carries for 62 yards and a score. The win marked the season’s high water mark for the Packers. They lost to Minnesota the next week and, with the offensive productivity dropping off, won just two more games the rest of the way, finishing at 8-7-1 and second to the Vikings in the NFC Central. Seattle recovered to win six of the remaining nine games and end up at 9-7, the franchise’s first winning record, placing third in the very competitive AFC West. David Whitehurst passed for 2093 yards with 10 touchdowns but also 17 interceptions, and while he showed poise and promise, he ultimately became a career backup. Terdell Middleton rushed for 1116 yards and 11 TDs, receiving Pro Bowl recognition in what was easily the most productive season of his career. James Lofton, whose career track would be far more impressive, also was chosen to the Pro Bowl after catching 46 passes for 818 yards (17.8 avg.) and six touchdowns. Jim Zorn led the AFC with 248 completions and 3283 yards, although he was also sacked a league-high 44 times. 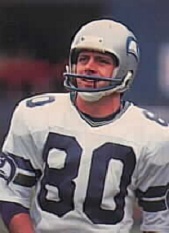 Steve Largent topped the conference with 71 pass receptions and his 1168 yards ranked second in the NFL. He was named to the Pro Bowl for the first of an eventual seven times.